Daniel gives Jack flying lessons. Jack is falling into Daniel, piece by piece. Daniel makes a little mistake while on a mission. Jack and Daniel are imprisoned off-world. Jack and Daniel are both a little rattled after a close call. A little slice of life, and the "happy place." Jack just wants to hear Daniel say those words. Daniel, body paint, and an interesting ritual. Jack's world is rocked. Daniel bakes. Jack gets excited. 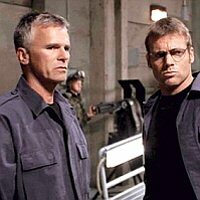 Jack meets up with a deascended Daniel who can't remember much of anything. Jack takes his descended Daniel home. Things heat up from there. Sequel to "Hope." Stargate SG-1 (including all characters and images) is the property of Showtime/Viacom, MGM/UA, Double Secret Productions, and Gekko Productions. No copyright infringement is intended or should be inferred. This is a nonprofit fan site.